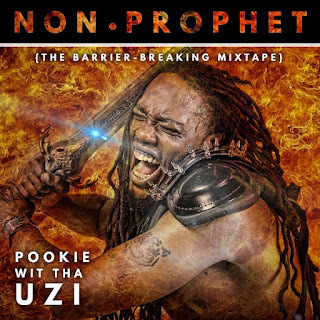 Christian Rap Artist “Pookie wit tha Uzi” release his new mixtape project “Non Prophet”. Adrian Logan also known as "Pookie wit tha Uzi" is among the 1st selected to start recording his project at the grand opening ribbon cutting for “All Real Entertainment Multimedia" Recording Studio. “Pookie” was led by the Holy Spirit to present a vision through his new album titled "Non Prophet". He feels compelled to share his testimony and have the right team of talented superstars to aid him with the engineering. Upon the release of this hot project, you will surely receive an amazing and awesome experience. It will also be the precedent at All Real Entertainment Multimedia Recording Studio where Pookie will break down barriers for other Christian rap artists to record there. The producer of the project is Rjbeats. The engineering task is given to Alex J. These guys have worked with Pookie on previous projects and the three of them has developed a trusted bond and a great working relationship. You can count on a powerful finished mixtape that Devine Jamz Gospel Network has been chosen to market to a targeted demographic of people interested in Christian rap music. We are very excited on what the Lord is doing with Adrian “Pookie’ Logan. And we are honored to represent this young fellow through a marketing and advertising partnership. Featured Christian Rap Artist "Pookie wit tha Uzi" Prepares For "Spit your hottest 16 bars" Contest!